The Mystery Of The Singing Fish – Solved! For the first time in the 1980s, California houseboat residents heard humming noise. They assumed that it might be coming from military experiments, noisy sewage pumps or even extra-terrestrials. But to their surprise, this sound was not normal hum but the nocturnal hum of the midshipman fish; which was basically a mating call or a courtship call. This was resolved by some biological secret scientists. Few researchers brought the fish into their lab to further enquire about their humming sound at night. What Exactly Is A Singing Fish? In the journal of Current Biology, you can read the findings of the US team regarding this mystery. There is a hormone known as Melatonin which helps humans to sleep and as per research it was found that the singing of this fishes was controlled by this particular hormone. And when researched more closely how actually Melatonin affects receptors in various parts of the fish’s brain which explain why it is such a powerful “chemical clock”. Along with this, there was also a noticeable change in the timing of reproduction, reproduction and birdsong. This successful research was led by Prof. Andrew Bass. He stated that his inquisitive thirst about solving the mystery midshipman fish helped him arrive at a conclusive reason behind the humming sound. He further acknowledged that the midshipman fish had been covered by a renowned paper written in 1924. This was mentioned by an academic called Charles Greene which also described how the male fish would hum at night. Prof. Bass mentioned that Greene referred midshipman fish as the California singing fish. He also said that they discovered that even females are sonic, but the difference is that only males build nests and produces hum to attract females to their nests. Now they were curious about the timings of the humming sound. They wanted to know if the humming sound was produced out of an internal clock or circadian rhythm. The team tested this by keeping a group of midshipman fish in constant light. This almost completely suppressed their humming. They gave these fishes a substitute of Melatonin and they saw that fishes continued to hum at random times of the day without a rhythm. This Substitute of Melatonin essentially acted as a ‘go’ signal for the midshipman’s nocturnal calling. 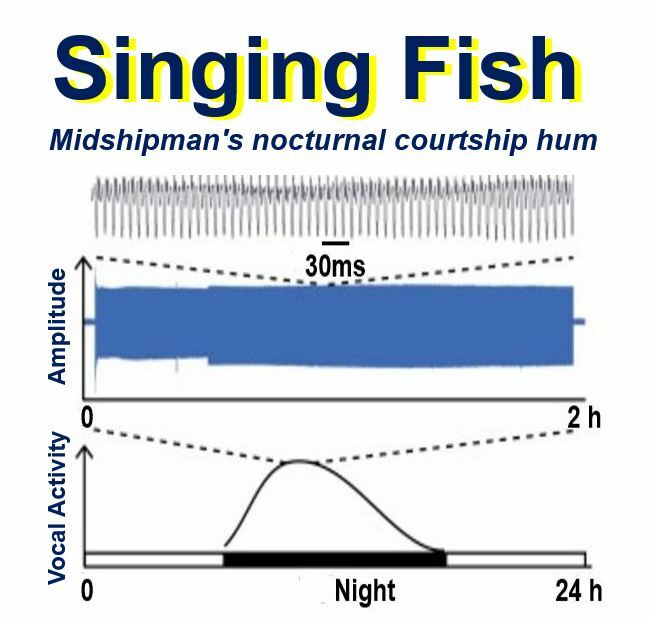 Limiting midshipman’s fish foghorn-like serenade to the night time probably benefits the fish. When females are more receptive a nocturnal chorus might be timed or when their predators are more likely to hear. This study about midshipman fish suggests a broad but fundamental role for Melatonin amongst the vertebrate family. Although the behaviour of a fish is closely linked, recent research on body clock points that their brain circuitry during the initial stages of their evolution. Another study by Dr Ni Feng, from Yale University, said that Melatonin is the same supplement that humans might take to fall asleep earlier and get over jet lag faster. But it was not the case with the midshipman fishes, as a substitute to Melatonin wakes them up and pave the way for their nocturnal courtship song performance. So out of all the above experiments and studies conducted by researchers , it can be said that singing fish can be a useful model for studying hormones and mating or courtship related vocal communication behaviour shared by many vertebrate species.